PBJ Design Society hasn't added a story. 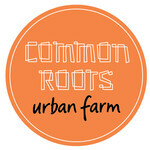 In our first seven years, Common Roots has grown nearly 45,500 pounds of food, right in the heart of Halifax. We have engaged 5,600 members of the Halifax community, and had around 2,500 visitors each year. We have provided land for eight newcomers to Canada to start farm businesses. We have been an example of regenerative land stewardship and a step towards food security in a changing climate. We have expanded the idea of what is possible in Halifax. And all this is just the beginning. 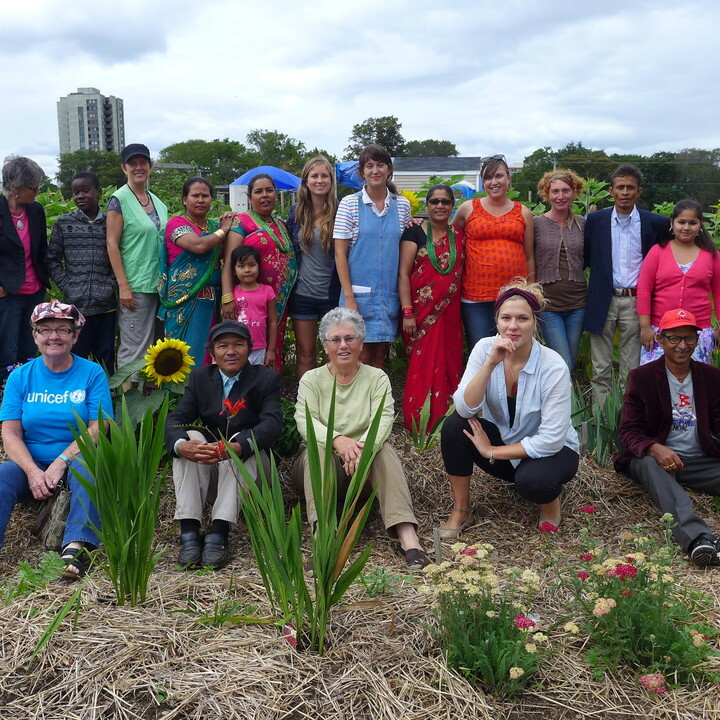 With the QEII Health Sciences Centre redevelopment project slated to begin, our vibrant community farm is coming to the end of its final growing season at the current location at the corner of Robie Street and Bell Road. In April of 2019, we will move to a new location. Even though we don’t know all the details yet—see below for more about where we’re going!—we are certain we’ll have a location confirmed before April, and know that it will cost at least $20,000 to move our precious soil, sheds and greenhouse. We will need to coordinate volunteer labour, feed hard-working volunteers, hire trucks and some equipment. This is what we’re crowdfunding for. We need your support in this complicated time. This project means a lot to a lot of people. If you can add your name to the list of supporters, please do. We got a quote from a contractor to move the farm for $60,000. This was an estimate to move everything, and did not account for volunteer labour. 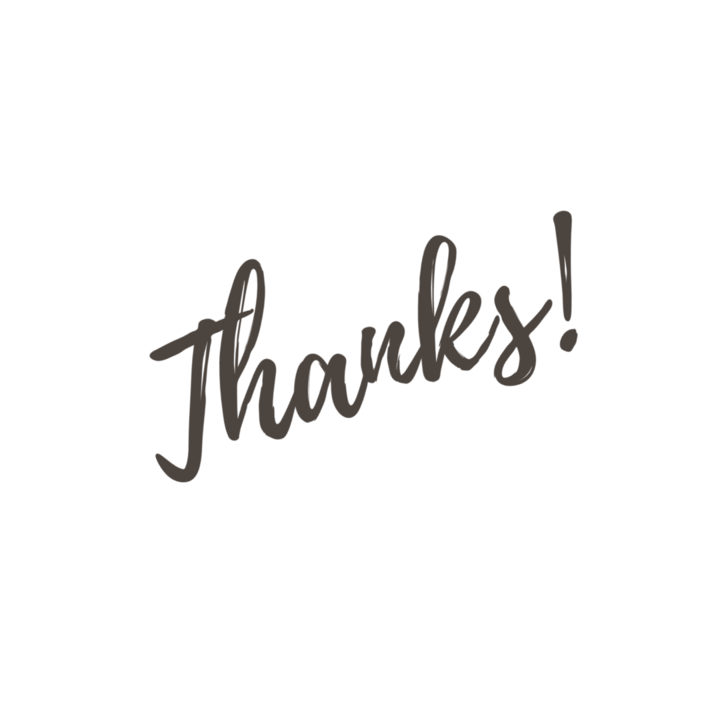 We know we can do it for less—we have had so many offers of support from various individuals and businesses. We plan to coordinate work days to make use of offered vehicles and volunteer labour. The first $5,000 of funds we raise will go towards organizing these volunteers efforts. 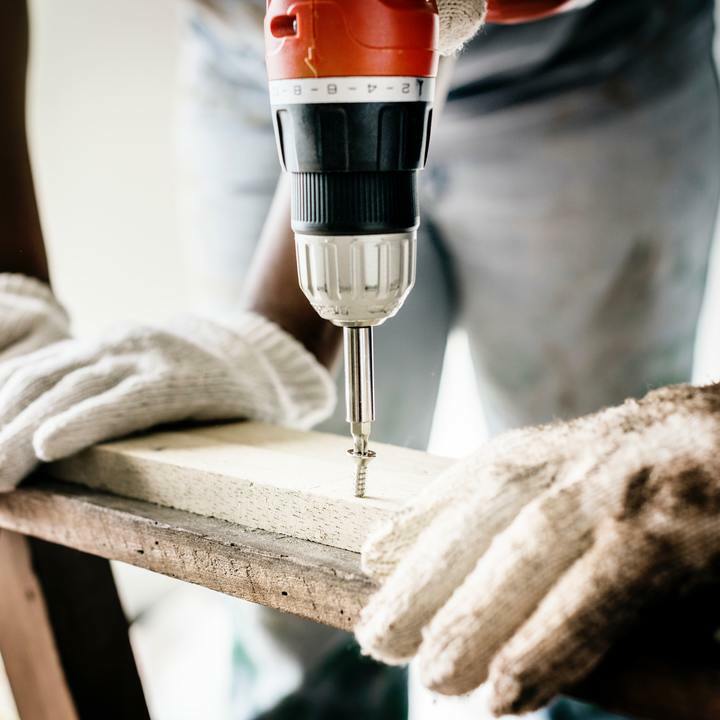 We will require skilled labour to move some of the infrastructure on site, such as the Rick Hansen Healing Garden, the greenhouse, and wash station. The next $5,000 of funding will go towards hiring contractors to guide the disassembly of our infrastructure, and for trucking it to our new home. We know we’ll need more than $10,000, but this amount would go a long way towards getting us started. We’re working on finding a partner to match all raised funds. (Know of one? Send them our way!) We’re looking for further grants and sponsors. We’re a ridiculously determined and optimistic group, and we’ll keep you in the loop every step of the way. More than 250 people attended a public engagement session in April to suggest alternate sites, and a volunteer Urban Farm Transition Team has been pursuing all options since then. Suggested sites included the former locations St. Patrick’s High School and Gorsebrook Junior High School, along with the proposal that the farm move on to the Halifax Common. After looking thoroughly at municipal, provincial and federal options, we have found nothing that seems doable within our current timeline. We are now looking at privately-owned public spaces and are talking to private landowners and the community of developers to find a large sunny area where we can grow. We’re able to stay at our current location beside the Halifax Infirmary Emergency department until next April, instead of the anticipated move date of this October. PBJ Design Society hasn't posted any updates yet. Illustrated by Erin Robison, a Lunenberg artist. Screenprinted at RadStorm, by a volunteer. 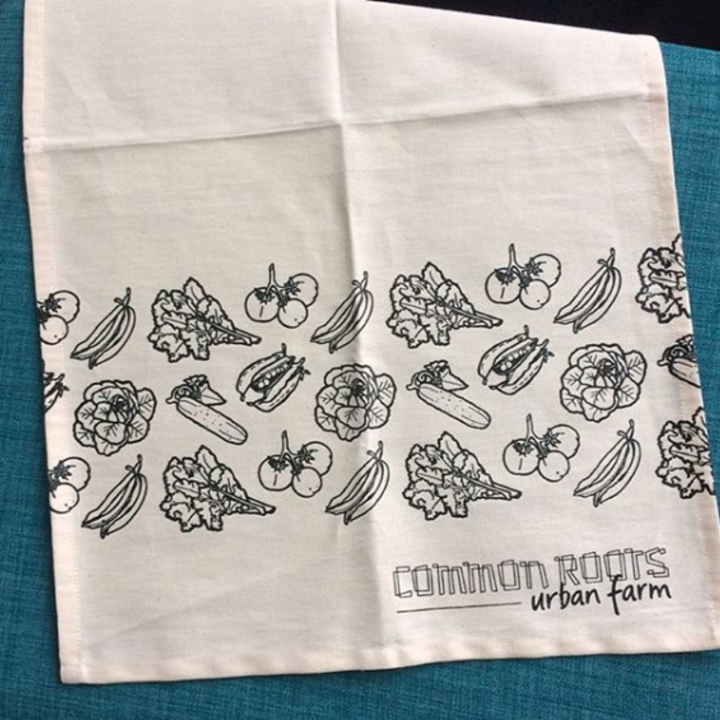 7" x 10"
A hand-made natural cotton tea towel, screen printed with the Common Roots logo and an adorable veggie design. 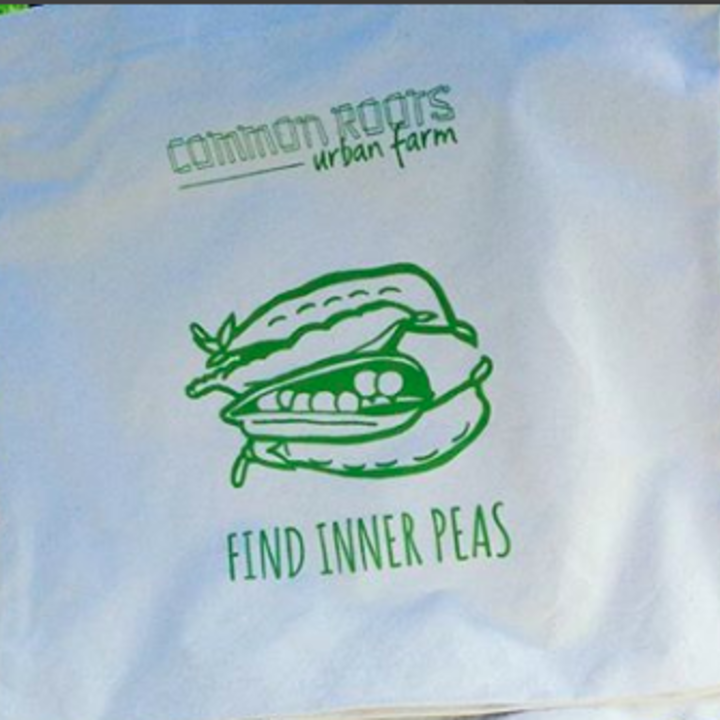 A screen-printed "Find Inner Peas" tote bag with the Common Roots logo and a huge thank you and shout out on social media. Buy lunch for a volunteer crew! Your $200 will buy lunch for a crew of volunteers working hard to haul all the precious parts of our farm to a new site next Spring! Your $500 will hire the skilled carpenters we need to dismantle the Rick Hansen Healing Garden and other infrastructure safely. 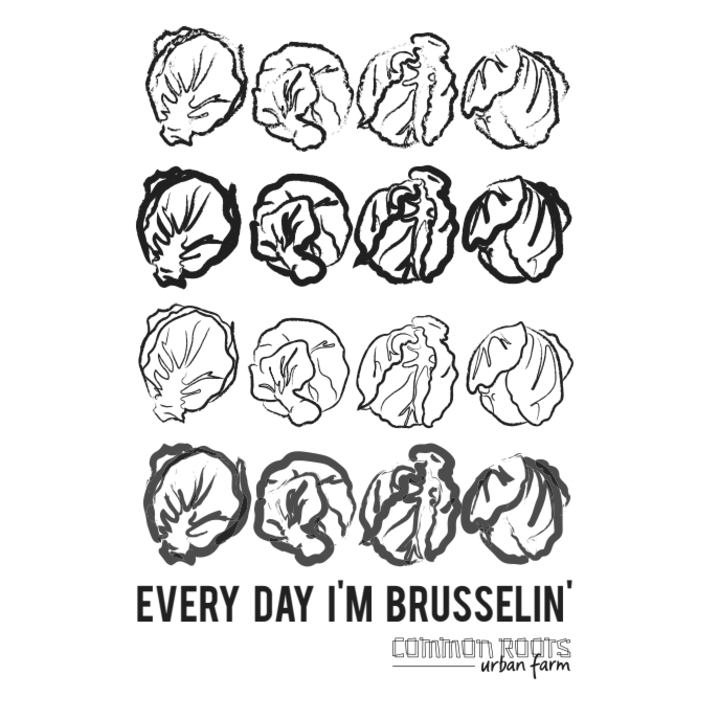 PBJ Design Society is managing the funds for this campaign.